As a number of outlets are reporting, the Israeli security firm Cellebrite is the source the FBI is using to attempt to break into Syed Rizwan Farook’s phone. Israel’s Cellebrite, a provider of mobile forensic software, is helping the U.S. Federal Bureau of Investigation’s attempt to unlock an iPhone used by one of the San Bernardino, California shooters, theYedioth Ahronoth newspaper reported on Wednesday. If Cellebrite succeeds, then the FBI will no longer need the help of Apple Inc, the Israeli daily said, citing unnamed industry sources. Cellebrite officials declined to comment on the matter. According to the narrative the government is currently telling, it means 33 days after DOJ obtained an All Writs Act on February 16 ordering Apple to help unlock Farook’s phone, and 108 days after FBI first seized the phone on December 3 — during which entire period the FBI now claims they were diligently researching how to crack the phone — on March 20, Cellebrite contacted the FBI out of the blue and told them they can help. That’s interesting, especially given this search warrant, approved (as coinkydink would have it) on February 16, the very same day DOJ got its AWA in California. Among the phones DEA obtained a warrant to search was an iPhone 6, a later model than Farook’s phone with default encryption (though running unknown iOS). Here’s what DEA Task Force Officer Shane Lettau had to say about how he (might) access the contents of this iPhone 6. To be sure, these phones aren’t the same, nor is the agency. Farook’s is a 5C running iOS 9, this is a 6, and we don’t know what iOS it is running. But if Cellebrite can break into a 6 they presumably can break into a 5C. FBI is seeking access in CA, whereas this MD phone is in DEA’s possession. The point is, however, that it is inconceivable to claim, as DOJ did 19 times, that the only way they could get into Farook’s phone was with Apple’s help when DOJ was at the same time participating in DEA’s discussions with Cellebrite about whether they could crack a later model phone. 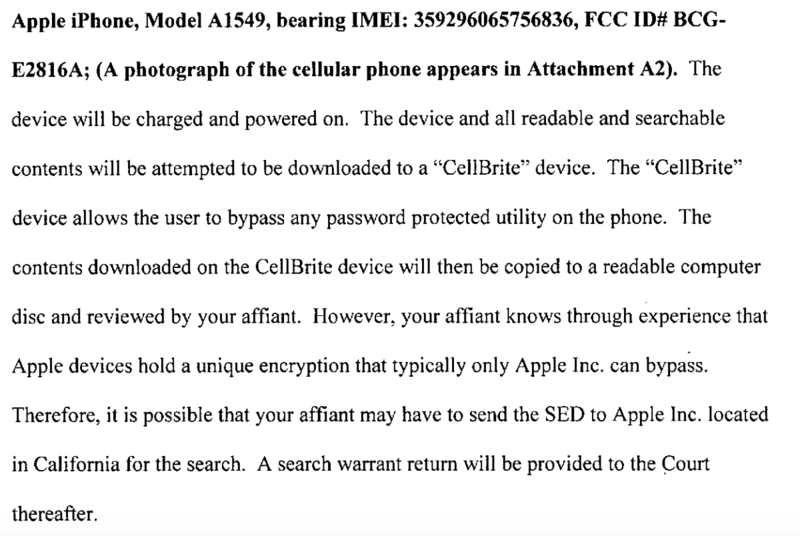 It may be that Cellebrite only perfected their technique with iOS 8 and later model phones in recent weeks, or that they could not crack an iOS 9 in December or February but have since perfected that, but DOJ still shouldn’t have been submitting sworn declarations pretending that Cellebrite was not a possible option. Update: I originally said Farook’s phone was a 5S. I’ve corrected the post to say it is a 5C, h/t JC. Update: FBI signed a contract with Cellebrite on the same day it announced it had found a solution, though I think it’s for license renewals for 7 machines in Cook County. Great moments in one individuals fight to secure the truth by utilizing talents unbenownst on the entire planet while making a laughingstock mockery of the FBI’s attempt to pull the wool over the judiciary while hiding it’s prime motive. Notwithstanding the warrant on the Lexus… the next step is to simply declare the entire planet under a warrant. After all..what we’ve seen has already redefined General warrants. When the iPhone 6 was released (September 2014), it came with iOS 8. iOS 9 came out in September 2015, if that helps timeline estimates. There sure are some discrepancies in the testimonies for this case. Any chance the presiding judge will hold some feet to the fire to get straight answers?